In that '62 picture, they already look like they're going to fall down. Not surprised they were gone by the '70's. Too bad. They were certainly at the point in their lifecycle where they needed substantial reinvestment. Unfortunately for them and scores of other buildings in the core, society decided to take that capital and build the suburbs. 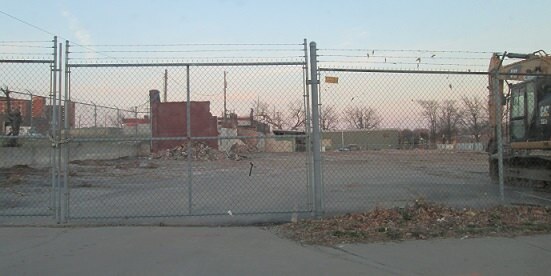 The warehouse building on the NE corner of 9th and Paseo is being demolished. The Quinlan Place apartments will replace it. Site preparation for Quinlan Row townhouses at E. 9th and Woodland. I am asking forum participants to chime in with the City Council on this development. 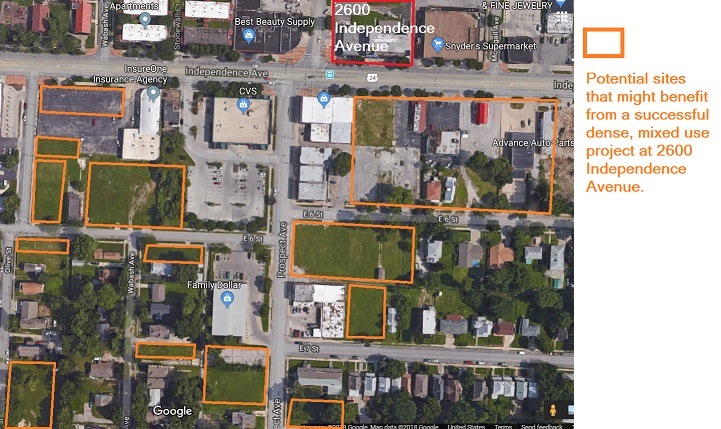 Development hearing scheduled for Wednesday, June 20 regarding redevelopment of 2600 Independence Avenue (at Prospect). The hearing for the proposed development at 2600 Independence Avenue was delayed again last month, and has been rescheduled to be heard by the Planning, Zoning and Economic Development Committee on Wednesday, June 20 at 1:30 p.m. on the 26th floor of City Hall. We've been assured the issue will be discussed this time and it will be first on the agenda. 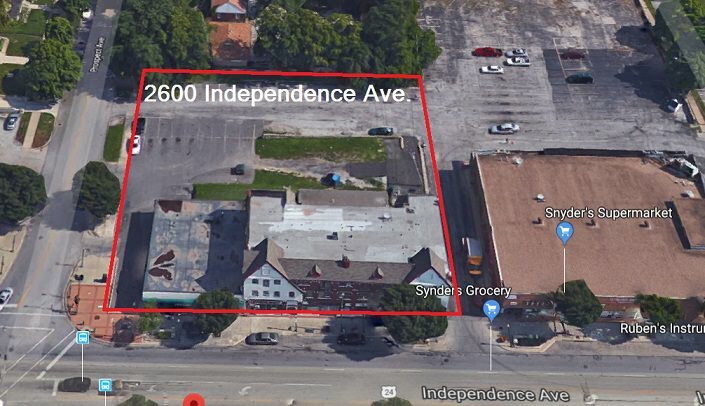 A single-story retail building is proposed for the northeast corner of Independence and Prospect, the location that suffered a tragic fire in 2015. View the renderings for the proposed development. **There are no identified tenants for any of the retail spaces. **The single-story development does not create density and positive activity at an important intersection. A multistory development with residential above retail would be more in line with the past structure and create a safer intersection with more eyes on the street. **This specific intersection has been identified by both RideKC in its study of bus service on Independence Ave and the City of Kansas City, Missouri, in its transit-oriented development policy as having great potential to reap the rewards from transit service investment. A single-story retail development will remove that possibility, leaving the neighborhood with a suburban strip mall with potentially no tenants. We are asking city leaders to set a higher standard on a key parcel of land that has the chance to shape the positive trajectory of the future of Pendleton Heights, the success of the Paseo Gateway, and will be relevant for generations to come, like the historic homes we all love. We'd love to see as many neighbors as possible at the meeting, but if you can't make it we ask you to consider sending an email to elected officials or voicing your opinion on social media. It's important that we all share our concerns on this issue and send a powerful message about our vision for the future of Pendleton Heights. Here are some other points I have made to council members. This is a major intersection in the Historic Northeast that should be a mixed use zone. 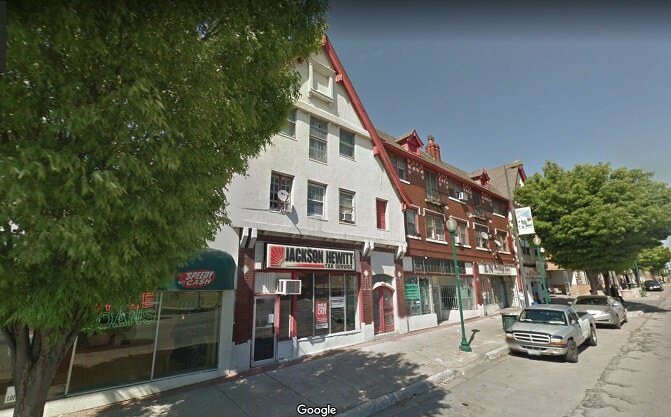 The property should be a transit-oriented, mixed-use, development that ideally would be 3-4 stories including street-level retail and apartments above. This neighborhood desperately needs multi-family, and housing for seniors and the disabled, on transit routes that are also near a grocery store (Snyder's) and a drug store (CVS across the street). There is also a Family Dollar store near that intersection, Central Bank, health clinics, and several churches nearby. Kansas City University of Medicine and Biosciences is a short distance away. There are residents who don't own cars, or can't drive, who need housing near health clinics, banks, churches, drug and grocery stores. It is very difficult especially for seniors and disabled to do their grocery shopping on the bus, and would benefit from housing next-door to a grocery. This site is ideal for new housing of that type. The proposed development really makes little effort to be dense or urban as would be fitting for its' site. A successful redevelopment of this parcel might result in redevelopment of nearby properties. All great points Fang. Yes I of course remember that old building. RIP to heroes John Mesh and Larry Leggio. This project is absolutely not a good use of a highly visible, desirable piece of real estate. Who is the developer here? This proposal is something more in line with a suburban area. alejandro46 wrote: This proposal is something more in line with a suburban area. This is absolutely not suburban. My spouse and I are Scarritt Renaissance residents. We agree with all of your points, FangKC, and would just add that the transformation of IA from Paseo to the new Pendleton ArtsBlock speaks to a growing wave of investment moving west to east on Independence Avenue. There is also a MAX rapid transit study currently underway for Independence Avenue. And people are being pushed out of Downtown and River Market every day, prompting immediate need to both market rate and low income housing in Northeast. To allow a non-conforming development that doesn't, at the very least, provide for the lost residential space, and that has NO IDEA of who might be a retail tenant, detracts from the positive momentum on the Avenue. We have a real opportunity to make this very important intersection an asset for all of Northeast. We don't oppose development, but we must insist that the developer embrace it's role as a part of the community and not simply an empty box builder. The point also needs to be made that units in apartment buildings that have been demolished in the Northeast need to be replaced. Kansas City University demolished five colonade apartment buildings recently, so there is that. KansasCityGypsy wrote: This is absolutely not suburban. It has all the hallmarks of a suburb, you even have a good self-definition to work off of. "Pendleton Heights was developed as Kansas City’s first suburb"
NKC is as dense as parts of the historic NE in terms of homes and you would call it solidly suburban. Go look at the NE, it's blocks after blocks of single family homes. there's a lot of small houses in a tight design but NKC has more apartment complexes per block than the NE does. It's able to have people live denser than much of the historic NE. Independence Ave is a commercial strip at the sidewalk. downtown NKC has Swift and part of Armour does too where everything is right at the sidewalk. both have a bus down them. Saying no doesn't change that 90% of the land inside KCMO is suburban styles. Waldo is a suburb, so is Brookside. You can't point to a handful of towers and calll them urban because old Overland Park looks much the same in density with a handful of taller buildings. By that logic, all of the east side - which has a notably reduced tree canopy - isn't suburban. Or something. What? And all of cities such as LA and Phoenix are entirely urban even where everything is one story and surface parking since there is no tree canopy anywhere. Interestingly, M.A.C. Corporation showed up with 119 "letters in support" though in all of the months of discussions and meeting, I have only heard or seen two people express support for the development, and they're both employees of the Northeast Chamber of Commerce and Independence Avenue CID. What makes that really interesting is that the president of the Northeast Chamber of Commerce and Independence Avenue CID, Bobbi Baker-Hughes, serves on the City Plan Commission. She, of course, has said nothing about the development publicly. I would think the Northeast Chamber of Commerce and IA CID would want a denser development that included residential, since having more residents would increase sales for area businesses as well as put more eyes on the street to reduce crime. The parcel viewer shows that property owned by BA Property LLC. Some community members wanted to know which retailers would be in the development. Robert Andrew, an engineer for M.A.C., said it is a speculative project, so no tenants have been identified, although he said they have been in conversations with a clothing boutique, an ethnic restaurant and other retailers. Andrew also said M.A.C. looked into adding apartment units above the retail space as residents had requested, but determined that was beyond the scope of their abilities. M.A.C., which stands for Midwest Associated Contractors, is different from MAC Properties, a Chicago-based company that's developed 1,500 apartments and is the front-runner to build a proposed mixed-use building at Troost Avenue and Armour Boulevard. If adding some apartments above the retail is "beyond the scope of their abilities," then perhaps this isn't the appropriate developer of the site. It used to have them, 99% of them have been torn down. There used to be very large multi-story tenement houses on Admiral, Independence Ave, 8th and 9th st. Sadly, the buildings that have survived are the ones built with setbacks from the curb. moderne wrote: And all of cities such as LA and Phoenix are entirely urban even where everything is one story and surface parking since there is no tree canopy anywhere. I wouldn't call LA or Phoenix entirely urban. Take a square in Phoenix and a square in Overland Park and you probably will find a similar development pattern. A bunch of homes, maybe a school or church and a strip mall. LA is absolutely denser in total than KC but you can go to places like Beverly Hills and find 7 story apartment buildings. That so much of the city is one story and dense doesn't make it urban development. There's a giant warehouse district south of Compton that's easily denser than our Crossroads and I wouldn't call that urban. Suburbs can be much denser when you don't have 16 feet + between homes. Makes for a good example that our setbacks are all wrong more than anything. Urban Development is developing like a city. Mixed use, frequent zoning changes, taller structures, transit that allows for distance expansion of all activities, ability to make a living without leaving the area. Tell me how much of the historic NE you can walk to a grocery store within 3 or 4 blocks? There's a bus that runs through the neighborhood but it doesn't go down a commercial corridor, it heads downtown instead. That's not a bus designed for urban living where you use the bus throughout the week, it has more in common with 238 which is targeted to suburban commuters. A proposed retail development at 2600 Independence Avenue will have to wait at least another month for a chance at approval from the City Council’s Planning, Zoning and Economic Development committee. The short-handed PZED committee – members Katheryn Shields and Quinton Lucas weren’t present – opted against making a decision on Ordinances No. 180189 and 180199 on Wednesday, June 20, instead opting to hold the items until July 25 to allow time for further conversation. 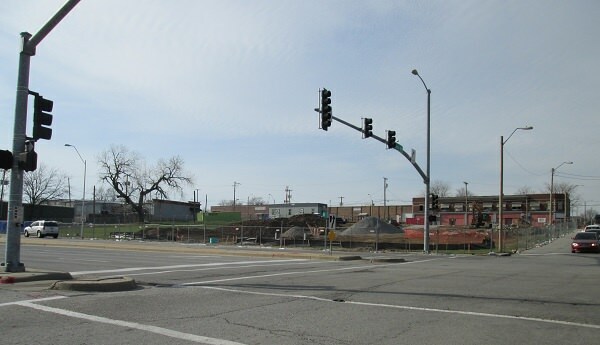 Both ordinances are related to the same retail development – a speculative venture located at the site of a deadly October 2015 fire that tragically claimed the lives of KCFD firefighters John Mesh and Larry Leggio. While beating back this development would be a near-term victory for neighborhood leaders opposed to the project, it could portend development struggles moving forward. If the M.A.C. Corp development is struck down, the northeast corner of Prospect and Independence could be without development for a long while. At least at present, BA Properties, LLC isn’t looking to offload the parcel to another developer. Andrew conceded that the project is purely speculative, and relayed that the property owners do not have interest in persevering through the learning curve associated with owning and operating residential units. 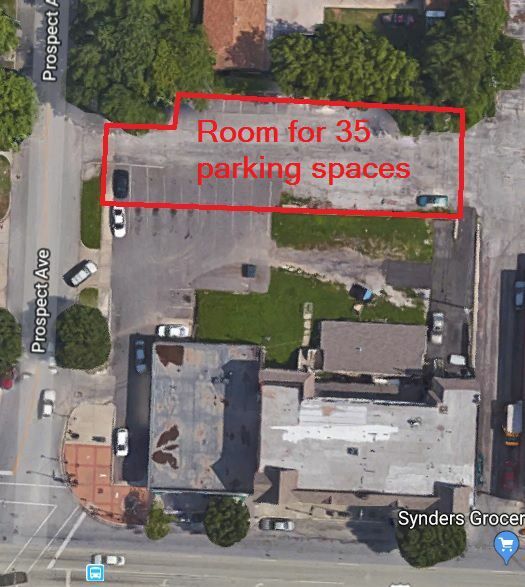 Andrew further argued that there isn’t enough space in the parking lot to accommodate the residential units requested by neighborhood leaders even if residential units had been considered economically viable. Andrew said after the meeting that he’s willing to meet again with neighborhood leaders, and that he’s planning on reaching out to 3rd District Council members Lucas and Jermaine Reed for additional guidance. That said, Andrew indicated that if the July 25 meeting doesn’t go better than the one on June 20, the project may not go forward at all. With no immediate inclination from the ownership group to sell the property, it could remain without any development for the foreseeable future. Is that a price that neighborhood leaders are willing to pay? No room for apartment parking on the parcel? There is room for a least 35 parking spaces just on the north part of the parcel not counting the former parking lot for the check cashing business that used to be there. 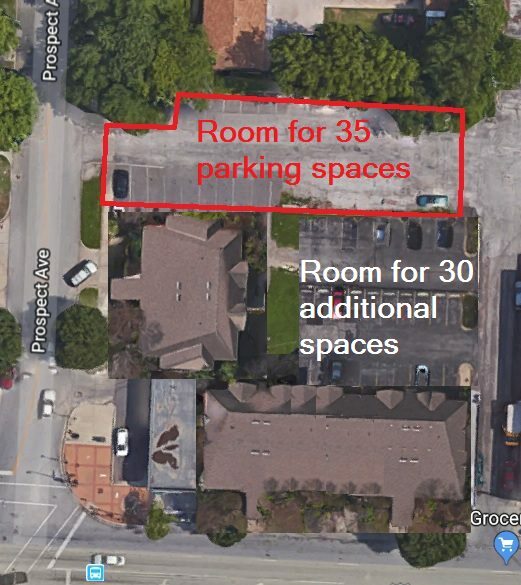 If 10 apartments got two spaces each, and 15 apartments got one space, there is room for 35 apartments just based on space to accommodate residents vehicles. There would still be room for some parking for any businesses. In a 4-story business, that would about 12 apartments per floor on the three upper floors. I love how the project manager thinks he can scare our neighborhood into going along with this piece-of-crap development proposal. LOL. OMG, a lot sits vacant for years! It appears most residents of the Historic Northeast are willing to endure this "tragedy" to hold out for a better development on that parcel. If the property owner doesn't want to develop apartments, then there is a solution. Just sell the property. I have overlaid the Quality Hill Square apartments from Washington and W. 9th Street onto the 2600 Independence Avenue parcel. They are 3-story apartment buildings with 12 apartments in each. I was able to fit three buildings on the parcel with room to spare, so 3-stories above retail would be 36 apartments. Last edited by FangKC on Thu Jun 21, 2018 8:20 pm, edited 2 times in total.